The Ohio State University is a founding member of a new coalition that will put important farm data into the hands of farmers while keeping it secure. The Agricultural Data Coalition (ADC) is dedicated to helping farmers better control, manage and maximize the value of the data they collect every day in the fields. It is the result of years of planning and coordination by AGCO, the American Farm Bureau Federation, Auburn University, CNH Industrial, Crop IMS, Mississippi State University, the University of Nebraska-Lincoln, Raven Industries, Topcon Positioning Group and Ohio State. ADC’s goal is to build a national online repository where farmers can securely store and control the information collected by their tractors, harvesters, aerial drones and other devices. Over time, that data can then be scrubbed, synced and transmitted in an efficient and uniform way to third parties — whether they are researchers, crop insurance agents, government officials, farm managers, input providers or any trusted adviser the farmer chooses. 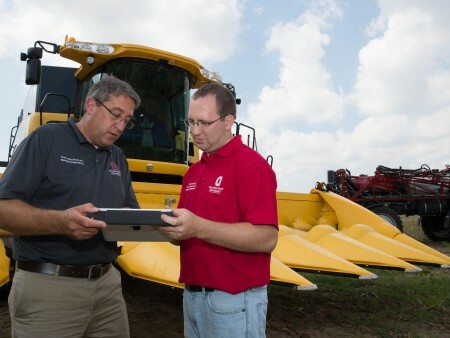 Ohio State created Translational Data Analytics (TDA) at Ohio State in 2014 to integrate the university’s data analytics expertise and – among other goals – to create multidisciplinary solutions in precision agriculture. Funding for TDA was made possible by the university’s Discovery Themes initiative, which is dedicated to using the university’s unmatched breadth and expertise to pursue solutions to the most important challenges of our times. Being a member of the ADC and having access to data sets will accelerate the development of new and innovative crop, pest, hydrologic and business models for agriculture, said John Fulton, precision agriculture specialist for Ohio State University Extension, the outreach arm of the college. Fulton and Shearer have been working together on this project since Fulton started at Ohio State in 2014, and together received seed funding from the College of Food, Agricultural and Environmental Sciences as part of the Field to Faucet suite of projects. “We will be able to evaluate and enhance ag data services, and Extension will be able to enhance programming with near real-time information delivery on cropping conditions, growing condition alerts and recommendations,” Fulton said. “The key is that farmers are in complete control, and they decide who is allowed access to their data,” explains ADC Interim Executive Director Matt Bechdol. “That’s what sets ADC apart. Farmers interested in learning more about data collection, and organizations interested in joining ADC’s efforts, may visit www.AgDataCoaltion.org.